So I had to decide this morning whether to confess the awkward blonde moment in my social media adventure this morning. As I am a brutally honest person who loves to joke about her own regular stuff ups – here it is.! I have a new plug-in that I am trialling – CoSchedule. It helps a shamozal person like me organise their blogs and posts. I can write for a whole day and schedule it to dribble out over weeks. I can let you know through all of my popular SM pages that the post is out! etc. Fantastic – I love it. So last week in my excitement I practised putting a pretend blog into my calendar for release to my SM pages this morning. I then of course forgot all about it, enjoying a lovely long weekend at home with my family and friends! Until…….one said friend, responded to my auto-twitter pretend post “Have you got that link?” AAAAaaaaaghhhhh. Tip 1 for CoSchedulers: Don’t schedule blog notice until blog written. Anyway I wanted to mention my new webpage “Dragon Dogs“. Our dogs are part of the SnowDragon journey. They run around the vineyard eating grapes, sleep at my feet in the office, chase waves on the beach and love the snow. Contemplating a view, with a wine in hand, is much better with a dog at your side. AND as the legendary Peter Lehmann once said “You can’t make a good wine without a dog.” I love my dogs. It seems that over the last few years many of my friends have said goodbye to their canine friends. It must be a decade or so since we first included a pup in our adult lives. I too said goodbye to the best Dragon Dog ever – “Mukha” (sanskrit for dog). 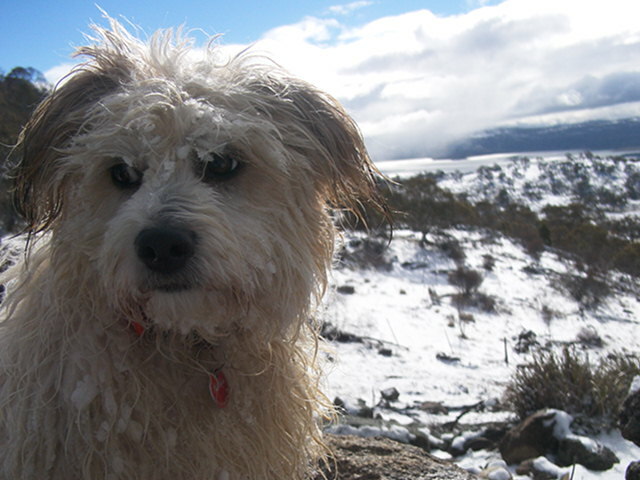 Mukha has travelled Australia for 14 years, joining in every adventure and been admired and loved by all that met him. He was the least judgemental, most forgiving, loyal, patient and happy friend I’ve had. He rests at a special family property on Kangaroo Island.